Kirsten Gillibrand is playing her cards right. The New York senator was a Clinton-inspired Blue Dog before she remade herself as a progressive champion. Sen. Kirsten Gillibrand on Capitol Hill on Dec. 6. In his usual semiliterate way, Trump essentially confirmed Gillibrand’s standing as one of the rising stars within the Senate Democratic caucus—vaulting the 51-year-old senator ahead of the pack of 2020 contenders, at least in the week’s conversation, and further away from her political beginnings. But on the question of Franken’s resignation, it took a fair bit of time for Gillibrand herself to catch up with them. Just a day before she ultimately called for Franken’s resignation, Gillibrand declined to say he should go. “I’m not going to say that today,” she told her interviewer at a Women Rule event. “But it is something that I am very troubled about.” That was nearly three weeks after Leeann Tweeden leveled the first allegations against Franken. The call to resign came only after a seventh accuser came forward, and as part of a coordinated effort from Democratic women in the Senate. 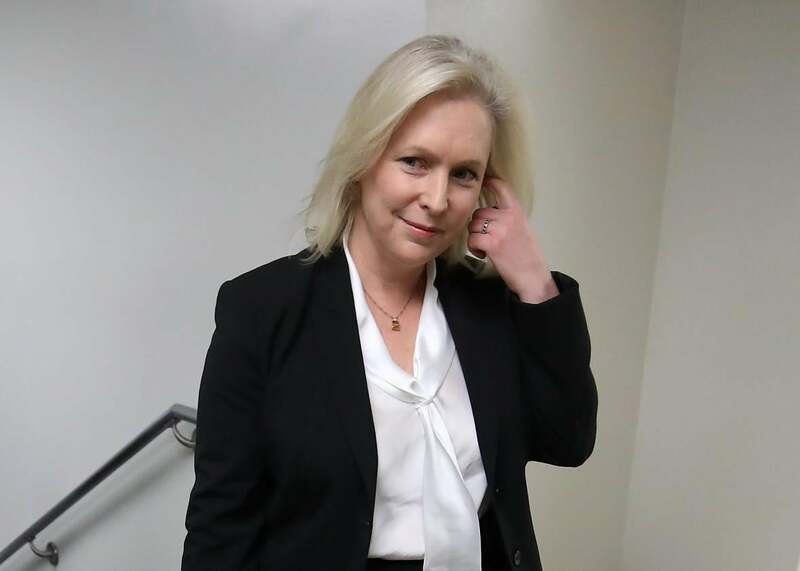 Gillibrand absorbed much of the credit for this move, but the extent of Gillibrand’s leadership on this particular controversy can be measured in the mere minutes between the statement she posted to Facebook and the tweets from her colleagues that shortly followed. All of this was preceded by a similar episode back in November. On the day Tweeden’s allegation broke, Gillibrand suggested to the New York Times that the Monica Lewinsky scandal might have warranted Bill Clinton’s resignation—a stance gaining traction among liberal commentators but not, as the Times’ Jennifer Steinhauer noted, by sitting Democratic senators with “longstanding ties to the Clintons.” “Things have changed today,” Gillibrand said, “and I think under those circumstances there should be a very different reaction.” The temporal ambiguity introduced here—as if the impropriety of the Lewinsky affair was ethically unknowable in 1998—was only deepened after the interview: “A spokesman later said that Ms. Gillibrand was trying to underscore that Mr. Clinton’s actions, had they happened in the current era, should have compelled him to resign,” Steinhauer writes. Well, they didn’t, and he didn’t; the question of whether Clinton, even given the mores of the time, should have resigned is a different question from whether resigning would be the decent thing if he were hypothetically president now. Answering “yes” to the former is an indictment of both Clinton, for not going, and those in the party who stood beside him back then. Answering “yes” to the latter is an indictment of no one in particular. All of this says much about the grip the Clintons have, or had, on the party and a little about the mettle of Kirsten Gillibrand, who has stepped out of their shadow and, particularly since Trump’s election, into the spotlight. The conspicuously progressive policy positions she’s taken, loudly, over the past year—support for a $15 minimum wage and single payer, resistance to the Trump agenda on everything from trans rights and DACA to Cabinet nominations—are in almost direct opposition to the campaign platform that carried her to Congress in 2007 as the unlikely winner of a seat representing a largely rural and heavily Republican district in upstate New York. She was an attorney then—a partner making half a million dollars a year at Boies, Schiller & Flexner, the law firm now implicated in the Harvey Weinstein scandal and the top source of contributions to her House and Senate campaigns. Upon winning, she became a member of the Blue Dog Coalition of conservative Democrats. She supported a balanced budget amendment and a ban on deficit spending. Her immigration platform was of a piece with the proto-Trumpism brewing during George W. Bush’s second term—no amnesty or benefits for illegal aliens; a crackdown on sanctuary cities like New York ; more agents, fencing, and tech for the border; and legislation making English America’s official language. The Human Rights Campaign, an LGBTQ advocacy group, gave her the lowest rating of any New York Democrat in Congress for her positions on gay rights issues. Her rating from the National Rifle Association, meanwhile, was a solid 100 percent. These positions, and her work in the mid-1990s as one of the lawyers defending the tobacco company Philip Morris from claims it had lied about the effects of smoking, made her a lightning rod when she was appointed to Hillary Clinton’s vacated Senate seat in 2009. New York Rep. Carolyn McCarthy, a staunch gun control advocate whose husband had been killed in a mass shooting, called Gillibrand “a very bad choice” and promised a primary challenge. Peter Rivera, a prominent Hispanic New York state legislator, said her record on immigration bordered “on xenophobia.” Three of her Democratic colleagues declined to appear at the announcement of her appointment; former Republican Sen. Al D’Amato, whom she had once interned with, showed up. But, mere days after she took office, a remarkable transformation began. She backed off on punishing sanctuary cities and deportations and signaled support for the DREAM Act. The New York Times’ Gail Collins noted that she’d “developed a hitherto unnoticed belief in gay marriage” and was taking meetings with the likes of Al Sharpton. And she backed a bill on gun show background checks put forward by Carolyn McCarthy, who never did launch that primary challenge. As it stands today, Gillibrand’s NRA rating is an F. Last month, Gillibrand’s PAC endorsed Marie Newman, a primary challenger running to the left of Illinois Rep. Dan Lipinski—co-chairman of the House’s Blue Dog Coalition. Gillibrand has offered appropriately anodyne explanations for her evolution. “Now that I represent the whole state and I represent these very different constituencies with very different needs, it is incumbent upon me to create legislative solutions,” she told Elle in the summer of 2009. Her conversion was so swift and complete that by the time she ran in a special election the following year, there was no longer any room to challenge her from the left. Her most serious threat, former Tennessee congressman Harold Ford, who now happens to be facing sexual harassment allegations of his own, made noise about challenging her from the center but ultimately opted not to run. Gillibrand won 63 percent of the vote that year, and then 72 percent when she ran for a full term two years later. She has drifted further leftward ever since. Gillibrand’s shift impressed her triangulating predecessor, who was roused to Gillibrand’s defense when the New Yorker profiled her in 2013. “There’s no great honor in never changing your mind when you’re confronted by either new facts, new evidence, or the responsibilities of leadership in representing a very broad constituency,” Clinton told the magazine. As Reines and Steinhauer implied, that quote is the least of the services the Clintons have rendered for Gillibrand—both Bill and Hillary have campaigned for her, and she inherited a slew of Clinton operatives, donors, and advisers once she settled in to the Senate—the fruits, probably, of both her work fundraising for Hillary Clinton’s Senate run in 2000 and their reputedly close friendship. Gillibrand’s comment on Bill Clinton was thus a sign of how far and how fast the influence of both Clintons might be falling, and intended as a signal, moreover, of her commitment to fighting sexual abuse. Measured as her bravery on both fronts might be, Gillibrand’s shifts are good news for those who would like to see the Trump era force a more progressive and strategically bold Democratic Party into being. It doesn’t follow that the party’s progressives should reward her for having an acutely sensitive finger in the wind, of course, although they might. Gillibrand is obviously banking on it.